Necrotizing Fasciitis called as flash eating disease is still prevalent in developing coun-tries. Surgical debridement under antibiotic cover is the mainstay of treatment and has usually good prognosis. 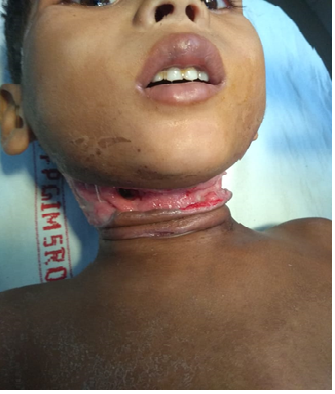 Despite advances of hygiene and antimicrobial therapy in developed countries, neck abscess and necrotizing fasciitis have a high incidence in developing countries. Underlying etiologies are found to be lymph node tuberculosis, diabetes mellitus, carcinoma with burst out secondary, post trauma wound infection, infected branchial cyst, and antecedent dental infection. 5 years male presented with open wound of neck, Fever, pain in neck and difficulty in swallowing for last 5 day( Figure 1 ). Patient fell in fields while playing and developed a lacerated wound 7 days back which was neglected by parents. When it started oozing 5 days back, they took him to tantriks. But the wound kept on increasing in size and became badly infected. So, patient visited our department. There were no associated complaints of difficulty in breathing and dental pain. There was no history of tuberculosis and tooth decay. Patient was non-diabetic, non-immunocompromised and poorly nourished belonging to lower class. On local examination, there was a 13X5X0.5cm wound over neck extending from posterior border of sternocleidomastoid of one side to that of other side and from 1 cm below angle of mandible to the lower border of thyroid cartilage with profuse yellowish discharge oozing out of it. The base of wound was reddish to white covered with discharge. Erythema of surrounding skin, tenderness and trismus were present. CECT neck showed Extensive edematous changes and mild fluid in the subcutaneous and intermuscular plane of neck- likely necrotizing fasciitis. Deeper structures appear normal. Pus sample was collected on a swab-stick and sent for pus culture and sensitivity. He was put on Injection Amoxyclauve, Injection Metrogyl, painkillers and antacids. Regular dressings and debridement done. Pus culture and sensitivity revealed Staphylococcus aureus sensitive to piperacillin-tazobactam and meropenem. After first sample of RFT and LFT came out to be normal, Amoxycillin+ Clavulinic acid was stopped and patient continued with Inj Piperacillin+ Tazobactam, Inj Meropenem and Inj Metrogyl. LFT and RFT were sent on alternate days. It took almost 30 days to obtain fresh granulation tissue. Patient was discharged in stable condition and referred to burn and plastic surgery for split skin grafting. 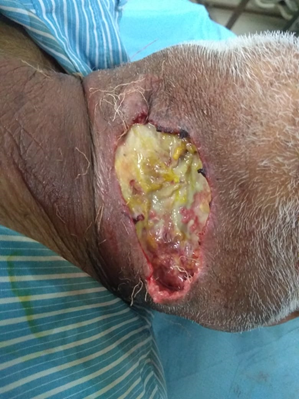 78 years male presented with open wound of neck left submandibular region for last one day ( Figure 2 ). He was a known case of Carcinoma base of tongue with ongoing radiotherapy and developed this wound as a result of burst out secondary. Patient had associated complaints of pain in neck and fever. There were no associated complaints of difficulty in swallowing, difficulty in breathing and dental pain. There was no history of trauma, tuberculosis and tooth decay. Patient was non-diabetic, non-immunocompromised and moderately nourished belonging to lower middle class. Patient was a chronic smoker and non-alcoholic. On local examination, there was an 8X4X1 cm ulcer between anterior border of sternocleidomastoid of one side to that of other side, 2 cm below angle of mandible to the upper border of thyroid cartilage. Erythema was present in the surrounding skin. However, temperature was not raised in this region and there was no tenderness. CECT neck showed Extensive edematous changes and mild fluid in the subcutaneous and intermuscular plane of neck- likely necrotizing fasciitis. Subcentimeter sized lymph nodes in the bilateral upper deep cervical group. Pus sample was collected on a swab-stick and sent for pus culture and sensitivity. He was put on Injection Amoxyclauve and Injection Metrogyl, painkillers and antacids. Regular dressings and debridement done. Pus culture and sensitivity revealed Pseudomonas aeruginosa sensitive to ciprofloxacin. Inj Ciprofloxacin was added to the antibiotic regimen. It took 20 days to obtain fresh granulation tissue. Split skin grafting done and patient discharged in stable condition. 37 years female presented with swelling left side of neck. Fever, tenderness and erythema present. No dyspnea and dental pain. It was also associated with difficulty in swallowing for last 2 days. There was no history of dental caries, tuberculosis and trauma. Patient was diabetic, well-nourished belonging to lower middle class. On local examination, there were no sinus, fistula and scar mark. Diffuse swelling 10X8 cm rt. parotid region, entire aspect of rt. side of neck and rt. supraclavicular region. Midline of neck to 3cm behind posterior border of SCM, rt tragus to rt clavicle. Firm with cystic areas in between, tender, erythematous. Crepitus present. No local rise of temperature. CECT neck showed ill-defined air containing collection in rt. Parotid space and further tracking down caudally superficial to scm muscle upto level of thyroid. Largest pocket collection (33X19X39 mm). Adjoining thickening of overlying platysma noted. Collection further extending medially upto rt. Parapharyngeal space with fat stranding. Rt parotid and rt submandibular gland bulky and edematous. Ultrasonography shows diffuse increase in thickening and echogenicity of subcutaneous tissue involving rt side of cheek. No accumulation of fluid in subcutaneous tissue. Few hypoechoic lymph nodes seen Cellulitis likely infective in nature. Pus soaked swab-stick was sent for culture and sensitivity. Fasting, post breakfast, before lunch, post lunch, before dinner and post dinner blood sugar charting done. Patient was started empirically on Injection Amoxycillin + Clavulinic acid and Injection Metronidazole along with painkillers, antacids, Inj regular Insulin on sliding scale, Inj Lantus 12 IU post dinner and Tablet metformin 500 mg twice daily after meals. Fundus examination done which showed early changes of diabetic retinopathy. Pus culture and sensitivity came sterile. Patient was managed with regular dressings and IV antimicrobial cover. Blood sugars remained fairly controlled during hospitalization. She completely recovered in 18 days. Four patients presented with necrotizing fasciitis. Underlying etiologies were trauma, burst out secondary, dental infection and diabetes. Culture and sensitivity revealed Staph aureus in two cases, Pseudomonas aeruginosa in one case and was sterile in one case. Patient was already on antibiotics before sending culture in last case. Minimum hospital stay was 8 days and maximum 30 days with average hospital stay of 21.50 days. All of them survived.